Kingdom Hearts III is a action RPG, it is the twelth installment and culmination of the Dark Seeker saga, a story that started in 2002 on PlayStation 2 and appeared in several titles on different platforms. 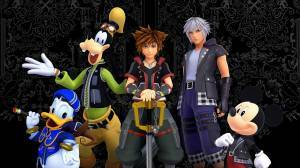 Kingdom Hearts III is set after the events of Kingdom Hearts 3D: Dream Drop Distance and continues the story Sora who is now joined by Goofy and Donald Duck and their search for the seven Guardians of Light and the 'Key to Return Hearts' as they try to prevent the restored Xehanort's plan to start a second Keyblade War. 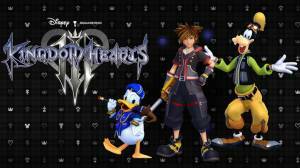 To be successful Sora and his friends must venture between different Disney and Pixar worlds and reshape them as they see fit by appearing in scenes from the films and banishing the inky monsters, called Heartless. To do this, Sora wields a sword called a Keyblade. You will get the Gummiphone early in the game. This gadget comes equipped with a camera which can be used for several things but mainly to take photos of the Lucky Emblems when you find them. As you walk around listen to your party as they will give you clues if a Lucky Emblem is nearby. Check out our What are Lucky Emblems page to find out more about them. During the game a yellow lock indicator will appear on screen at places where Sora can lock on to the environment and get some extra treasure with almost no effort. An example of this is in Olympus where if you lock onto the ankle of the statue of Achilles and hit it, the statue will crash through the wall and reveal a chest. As you progress your party will learn new abilities, many of them though will need to be activated manually so you will need to regularly check the Abilities screen to see what you have and to activate the ones you are likely to use so you can take advantage of the perks they offer. As using each of the abilites has a cost that takes up your overal AP threshold it is important that you properly manage them. Remember that the more you beat up on enemies the more special attacks and strategic options you will have at your disposal to use during a fight. Cycle through which attacks you trigger by pressing L2/R2 or LT/RT and reserve your special attacks for when you will get the most benefit from them. Make sure you cook up one of each dish type when you reach the point in the game where you are able to prepare meals with Remy. Doing this will allow you to eat a full course in the Cuisine menu which will give you a temporary special ability bonus and a buff to your stats. To cook the different dishes with Remy you need to ensure you have enough ingredients to cook with. This means constantly searching the world you are in and if necessary buying them at the Moogle Shop. Also pay attention to Sora, Donald, and Goofy as they will inform you whenever there's ingredients nearby. 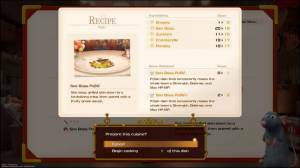 Check up on the menu frequently, as more recipes will unlock as you gather more ingredients. Check out our Where to Find Ingredients page to find out where to get the different ingredients for cooking. You are able to equip up to three keyblades, try to choose three that have contrasting formchanges in order to give you more options and more importantly three that will give you an advantage against the enemy types you're fighting in a particular world. Regularly visit the Moogle Shop not only to purchase potions, ethers, and equipment but also to upgrade your keyblades and synthesize materials. At the Moogle Shop you will be able to synthesize materials to craft armour, accessories, healing potions and other power-ups, and valuable materials for upgrading keyblades. Remember to return to the Moogle Shop regularly to see what snapshots the Moogle needs as getting them will often reward you with new synthesis recipes that tend to be far better than the standard ones listed.